Things are heating up in the SuperCoach world with plenty of big scores across the round as teams start to click into gear on the field. The rockers list is massive this week. Plenty of dry weather across the board contributed, and the difference between a top-tier score in the 1200s and something middling would likely have come down to who you put your captaincy armband on. Or, more accurately, whether you placed it in the capable hands of Damien Cook or not! Jai Arrow (13 minutes below average), Marty Taupau (13 below), Dale Finucane (13 below), Addin Fonua-Blake (13 below – due to a sin-binning late in the game), Paul Vaughan (17 below due to an ankle injury), and the worst of all, Andrew Fifita (20 below average, also suffered a hamstring strain late). Plenty of unlucky 13s there, and plenty of questions around rotations which should be getting shored up as the season goes on. Outside of this, there are some big movers in the Cheapie stakes, with Lachlan Burr going ballistic in his short time on the field and raising big questions about just how long he may be a viable option for, and the re-introduction of Payne Haas into the fold at starting lock for a mammoth 64 minutes! While that time on the field was assisted via the injury to Matt Gillett, his PPM will have plenty of people going early on him this week if they haven’t already. Round 5 also saw the demise of the much-fabled ‘Banner Curse’, with David Klemmer defying the odds to rack up a huge score. Beware the fallen gun, though, as the banner will be back to wreak havoc again this Friday. Who Flopped – the ‘SuperCoach-relevant’ players who killed your week Who Shocked – the left-field players who will no doubt be high on the list of trade-ins the next round and prime candidates for SC players chasing last week’s points! Injuries & Suspensions – early prognosis and possible SuperCoach impact. Cody Walker (150) – 4 tries! An unbelievable return from the attacking weapon who won the Rabbits the game. He’s racked up some terrific numbers since round 2, with a 3RA of 74 heading into this game without having truly cut loose so far. Had to happen eventually. Sometimes you just have to hold firm if these guys string together a quiet one or two games with their low base outputs, but you hold them for these exact reasons. Damien Cook (115) – Finally got the running game going effectively all match (10 runs all game, by far his most all season), and notched his first ton of the year. Just seems to love a dry track during the day and the Warriors barely had an answer for him. James Fisher-Harris (102) – Some biiiiig attacking points this week from JFH who was being looked at all week in the SuperCoach world due to his big minutes so far this season. While it’s a great score and anyone who jumped on will definitely not be complaining, you have to take into consideration that it’s very unlikely (based on his history) that those stats keep up, and while he got through 76 minutes on the field, he was brought off in the 63rd minute but forced to come back on with Isaah Yeo’s head knock. That said, if those minutes hold up, he’ll make you some great cash, especially with this ton rolling around for a few more weeks and a valuable body in the bye rounds. Latrell Mitchell (97) – This was a masterclass by the Roosters and this man was behind plenty of it. His price has freefallen so far this year as he’s spent time at 5/8 and in plenty of weather-affected games but finally got his running and offloading game going to rack up a big score. Another fallen gun who might have just bottomed out and will be back on the rise from next week. Josh Papalii (94) – Looked the best he has done all year and notched 55 minutes, his biggest return for the season. Base stats still aren’t great, though, and given he’s an Origin forward, he’s a tough sell. Would have put him in the shockers but for his 10k ownership. Very surprising but well done if you’ve held on. Corey Norman (93) – Combined with Hunt tremendously in this game and it looks like finally the Dragons have gotten their spine in order. 4 very handy scores in a row now, and hitting the same scorelines as the likes of Cameron Munster, but a fair bit cheaper. Worth a look? Kurt Capewell (91) – Two great scores in a row now and the forgotten man in the Sharks second row has gotten everyone’s attention again. He had to step up along with plenty of other Sharks forwards to fill the void in defence from the loss of Gallen, Woods and the injury to Fifita and did so handily and launched the score bigtime with a linebreak and two try contributions. Kind of at that awkward price now but if everyone fancied CHN as an option in the CTW this week, is it really too late to jump on Capewell if you didn’t already? Roger Tuivasa-Sheck (89) – A handy replacement for those that lost Tommy Turbo last week and looked as dangerous as ever. 60+ in every game so far and considering the Warriors have been ordinary in that stretch, that’s a pretty remarkable feat. Lachlan Burr (89) – He was on the park for just 46 minutes. And he produced this. Incredible. It’s littered with attacking stats (that go along with his usual solid base) including a try assist, 4 offloads (3 effective) and two linebreak assists. Anyone (like me) who missed out on him at the start of the year is kicking themselves. Playing like that, the only way is up in the minutes caper which is great signs. Jahrome Hughes (87) – His biggest score since round 1 and notched up two linebreaks and two try assists at crucial junctures of the game. David Klemmer (83) – Klemmer: 1, Banner: 0. Finally the curse is broken, but I think my SC Talk bosses missed the mark by going him in the first place. This guy has been beasting huge base point games all year and Round 5 was no different with another 60+ minute game, 60+ base points and, most important for anyone who has jumped on, plenty of offloads and tackle busts in a sign his running game isn’t letting up. It’s time to start treating him like the genuine FRF keeper he is. Nathan Cleary (82) – Ran the ball plenty and looked probably the best he has done for a full game all season. Has he reached his price floor at the $500k mark? Panthers have a pretty tough run coming up if you don’t own him, so given the congestion in the trading space at the minute, bargain hunters might not swoop too quickly. If his spot in the NSW side suddenly comes under threat, he would be a must-have for Round 12. Josh Addo-Carr (81) – A 61 last week to go with this round’s big score. The JAC rollercoaster goes on. Ran the ball just 9 times this game though as the Storm were uncharacteristically untidy with the ball in hand ¬and coughed it up too much for these guys to truly get going. Kalyn Ponga (81) – Owners were at panic stations when he went off for an early HIA but his absence was short-lived, returning to cut open the defence a couple more times and set up a try. It wasn’t a masterclass, but it makes you wonder just how big he could go when the Knights turn around their poor start to the year. Has only gone up $6k so is this the week everyone else jumps aboard? Briton Nikora (80) – The cheapie of the year just keeps rolling along with his usual solid base stat game being supplemented by 5 busts, 2 offloads and 2 linebreaks. Love your work. Viliame Kikau (78) – He’s picked up right where he left off in season 2018 and lifted his middlish base range with yet another try. The Panthers have missed him in a big way and as long as the injuries hold off, he’ll be slowly gathering owners based on his first two outings. Another that’s probably a must-have for the Round 12 bye but his pricetag of $570k won’t get much cheaper. Cameron Munster (78) – Hit base stats of around 40 yet again this week. While he’s just been getting the one or two attacking stats each round, he continues to motor along and pose a very valuable 5/8 option to start the season. James Tedesco (76) – He didn’t reach any real great heights in this game but Latrell Mitchell’s beautiful run and pass inside to Teddy in the second half helped deliver another meat pie to add to the growing collection. Proving week by week why he’s just a pure set and forget option. And to think people got rid of him early on. Alex Twal (75) – This is his 4th score in a row above 60 and he will not stay under the radar much longer. An incredible 54 tackles with just the one miss shows he just can’t stay out of the action. Just 22 years old so it’s hard to say whether or not that level of workload on a developing body is going to be maintained. The only thing that probably doesn’t make him an immediate buy is that he won’t play the Round 12 bye, whereas some of the others in the eye-line for SuperCoaches will fill that gap. Right now, he’s delivering gun-like returns for $500k. Won’t be affordable for long if that keeps up. Daly Cherry-Evans (75) – Continues to chug along nicely after having started slowly and scaring plenty of buyers away with a Round 1 score of 22. He’s putting up some big numbers while Manly offer some resurgence on the park and has amazingly gotten himself to a completely unattainable pricetag of $712,400 in that time! Another few big games could put him into Gareth Widdop territory from last year. Luke Garner (74) – Majority of SuperCoaches were in two camps with this guy: those that traded him out last week, and those that knocked him back to their non-playing reserves this round. Garner had the last laugh, though, crossing for a try and getting through plenty of work out there in the first half in particular. He was shuffled out to the centres to close out the game as Michael Chee-Kam (successfully) moved into the second row spot (after MCK originally came into the centres to relieve the concussed Robert Jennings). Great numbers from Garner though and that should mean plenty more price rises in the pipeline. Blake Ferguson (10) – Was in the wars all game and heavily targeted by the Raiders defence. Came off the field in the second half with damaged ribs. Did I also see him vomiting in the sheds pre-game? Rough night for Fergo but it’ll at least mean a halt to his price rises that have put him out of contention for most. Anthony Milford (22) – Another woeful display. Suncorp Stadium used to mean this guy would be hitting 80, but nowadays that’s closer to his error and missed tackle count. Wonder if a move back to fullback would reignite him from a SuperCoach perspective? At the moment, his running game is virtually non-existent, so might be a stretch. Warriors wingers/centres (Average of 26) – Their second collective appearance in the Floppers this season. All the attacking work was being done by RTS and the forwards, with this backline seemingly a combination of clumsy or disinterested most weeks. It’s not worth the stress of being owners of these guys. Jesse Bromwich (36) – Had been flying a little under the radar this year with an average of 64 but fell straight back into the JBrom of recent years with this dud score from his usual 50’ish minutes. Corey Harawira-Naera (39) – Unlike his tri-initialled counterpart in JFH, CHN was quiet in a soundly-beaten side on Sunday afternoon and stung a few new owners hoping for bigger things. If you’ve got him in your CTW, a floor of around 40 is nothing to panic about, but perhaps he has been a little overrated due to his bigger last couple of weeks. That said, he should have had a consolation try at the death if Jack Cogger didn’t inexplicably kick instead of pass, but his eventual score is a better reflection of the game he had. Possession in this game was 53:47 to the Dragons, so the fact he ran on just 4 occasions is similarly inexplicable. Lachlan Fitzgibbon (39) – A HIA to limit his minutes and a near-miss with Edrick Lee putting a foot on the sideline in the leadup to what looked like a Fitzy try, meant another mediocre score. His 5th of the year. Now needs a couple of big weeks in a row to salvage something for owners that have been patient with him to start the year. Angus Crichton (44) – The price was seemingly right this week and he finally got named and started in the second row without the Aubo switcheroos. All he really did all night was tackle, though, and got swamped nearly every run by the Sharks defence. No busts, no offloads. How often has that ever happened? Non-owners have bought themselves another week here with that return. Jai Arrow (47) – Jeez these scores are worrying. There’s got to be a niggle or something because a guy of this calibre getting 33 minutes less than Bryce Cartwright is borderline criminal. Couldn’t get anything going with his running game and had just the one offload and one tackle bust. He’s been all over the shop this season – two 40s, two 60s and a 110. That ton drops out of the 3 round average this week so he’ll drop a stack of cash, but you’d be breaking a big commandment if you were to give him the flick here. Marty Taupau (48) – Mentioned him above as having lost significant minutes this week and he’s just not been the same explosive Taupau we’ve come to know. Another one that might be carrying niggles that are holding him back, but is surely too important for the bye rounds to get rid of now. Ben Hunt (134) – Tore the Bulldogs a new one here, no two ways about it. One of his best NRL performances in years, possibly since 2015. Boyd Cordner (97) – Still have no idea how he got through to score so easily. Another guy that just has far too many peaks and troughs to ever trust, especially with Origin around the corner. Mitch Barnett (95) – Got 80 minutes of gametime this week and showed why he was once a genuine POD option in the game with 60 base points and a linebreak/try to go close to tonning up. Worth a look as Nick would say if those minutes keep up. Josh Morris (92) – Another rollercoaster that’s found his way to the peak again this week. Jack Williams (89) – More work and minutes than usual and got his third NRL try. Tohu Harris (82) – Had his second game above 80 in two years last week and has amazingly doubled it up here with another try through a yawning Souths gap. Looks to be striking a handy combination with Harris-Tevita on that left side. Could he be back? Michael Chee-Kam (78) – One of the great matchwinners you’ll see, simply because it came from one of the most unlikely providers. The elation on field and in the coaches box is what rugby league is all about. Michael Gordon (77) – Capped off 250 games in style with a try and 5 goals in the Titans’ first win of the season and a shoey in front of family and friends. Great stuff. Matt Eisenhuth (75) – Was a great POD for owners last year which saw his starting price at $505k this season, and it was hoped that plenty of games off the bench would knock that down to something midrange if he did eventually end up in the starting side. Tries off the bench don’t help those ideas! Kodi Nikorima (75) – One of those cases where the SuperCoach score stands completely at odds with how he played on the field. One moment of brilliance masked another directionless showing from Brisbane’s overpaid 6 and 7 and his hold on the spot looks shaky at best. Jayson Bukuya (74) – Picked up the slack left behind by the loss of Gallen and Woods and the injury to Fifita during the game. 64 base points and 3 offloads. I guess he did well for Draft owners. This week, we graduate Lachlan Burr, Reuben Garrick and Maika Sivo from the Simonsson Class of 2019 as they ascend into midranger territory. Of the two, Burr killed it this week as we noted in the Rockers above, while Sivo could have turned a 30 into a 60 quite easily had he received a better pass with the line wide open in the final minute. Payne Haas (77) – Will be on everyone’s radar now with a powerhouse performance to open his 2019 account. Starting at lock he made 42 tackles (2 missed) and ran the ball 17 times. Immense. The history of injury means it would be a brave move to bring him in early, but plenty of people already pulled that trigger last week. If he’s named at lock again, not many will leave him for next round. Chanel Harris-Tevita (67) – Should be in most SuperCoach sides this week and looks well-settled into his role at the Warriors. Mikaele Ravalawa (54) – Another try in the corner helps him along to more cash. Looks like the spot is his for the time being. Jayden Okunbor (46) – Not a bad return at all but 3 costly errors during the game might see his hold on the position come under more scrutiny than we would have liked. Would be unfair to single out the youngster as the Dogs were insipid across the board. $110k in cash made this week. Junior Tatola (35) – Nearing the $100k price rise mark which is great value for someone I figured would take the entire season to get there. Corey Waddell (46) – Back to business with a solid score from 44 minutes off the bench, likely boosted through the drop in minutes from Marty Taupau. Bronson Xerri (28) – Interesting call to be made for those looking at Xerri heading into his 3rd game this round. Hasn’t scored blisteringly so won’t jump up too much in price if he hits around this mark again. But you just never know. Corey Allan (16) – Some pretty rubbish scores mounting here, but surely he’s due a breakthrough coming up. Hame Sele (44) – Snuck in a try assist to boost this score handily. Kotoni Staggs (32) – A quieter return this week but with rumblings around about James Roberts’ time at the Broncos potentially being cut short he could remain a decent option for a while longer. Awkward price if you don’t already have him, though. Thomas Flegler (31) – Survives another week and hit just short of his breakeven. Owners can keep holding until something better comes along, at least. Tui Kamikamica (29) – Back to normal proceedings with this score from similar bench minutes. At least last week’s try will ensure another price rise this round. Marion Seve (28) – Has made $51k so far to exceed expectations, but will grow a little more with some nice rolling scores in here. Jacob Host (27) – Appears to have stalled now being shifted to the bench but TLT will determine whether he’s worth keeping around another week or not. Jaeman Salmon (16) – Could have helped everyone out by throwing the ball backwards out wide to Sivo in the dying seconds of the game but not to be. Chris Smith (43) – Surprising amount of work gotten through this week in limited minutes again. Zac Lomax (36) – Came onto the field late and almost instantly found himself being gifted a try off a bomb followed by a couple of goals. Patrick Carrigan (22) – Made his debut and nabbed just the 14 minutes off the bench. Thomas Mikaele (14) – Minutes have evaporated for a guy who was showing good signs at the start of the year. Missed last week also. Toa Sipley (10) – Cash in and run. Sam Lisone (42) – Yeah, nah. Francis Molo (33) – Yeah, nah. Kyle Turner (27) – Yeah, nah. Posa Faamausili (26) – Yeah, nah. Lindsay Collins (24) – Yeah, nah. Liam Knight (24) – Yeah, nah. Josh King (24) – Yeah, nah. Nat Butcher (23) – Yeah, nah. Hudson Young (22) – Yeah, nah. Keegan Hipgrave (20) – Yeah, nah. Braden Uele (18) – Yeah, nah. Tyrell Fuimaono (13) – Yeah, nah. Ryan Papenhuyzen (2) – Yeah, nah. Blayke Brailey (0) – A rare zero point game from 4 minutes on the park with no stats returned. Apparently that counts as it dropped his price. Lel. Plenty of injuries to get through this week, with the most concerning being the dislocated and fractured ankle suffered by Nene McDonald in that horrific clash with John Asiata late in the Cowboys’ loss to the Storm. It was a horrible sight to see and evoked memories of Jharal Yow-Yeh all those years ago. Thankfully the prognosis is not so bad, with a long layoff of 4-6 months now required after successful surgery over the weekend. Get better, Nene! In the same clash, the underrated John Asiata, who interestingly got the nod to start this week, had his elbow hyperextended but managed to play the game out. May be looking at 2 weeks on the sideline as a best case. Aidan Guerra also suffered a horrible-looking ankle injury in the Knights’ loss to Manly, with a possible dislocation/fracture as the same for McDonald. Awful to see for the veteran. On the SuperCoach front, potentially some injuries with an impact on the game coming out of the round. Andrew Fifita left the field in the second half after grabbing for his hamstring, which is an all-too-familiar sight in this game. Could be a couple of weeks at best on the sidelines for him as the Sharks’ forward stocks continue to deplete, but Fifita did come out after the game saying it was only minor and he could be back next round. Isaah Yeo went down with a possible AC joint injury that could see him out for over a month. Would be big news for owners of James Fisher-Harris, who was brought back into the game while Yeo was out, which could mean continued big minutes down the line if no one comes in to fill Yeo’s big-minute void. Blake Ferguson has a broken nose and possible fractured ribs to carry with him on the bus ride home from Canberra. With George Jennings suspended until Round 7, it’ll likely fall to Josh Hoffman or Bevan French to step up in Fergo’s absence (if he does miss any gametime). Paul Vaughan also suffered an ankle injury, no word as yet on severity. Host/Lawrie could possibly benefit if Frizell moves to prop to cover him if Vaughany is out for long. Joe Tapine’s return did not last long, with a nasty ankle roll seeing him off the field and looking like a hefty stint on the sidelines. Will mean the Bateman shift to the edge continues for the time being. Adam Keighran owners may have reason for hope with the unfortunate pre-game groin injury to Blake Green potentially seeing him out for a few weeks. Would be interesting to see if the Warriors would go with the CHT/Keighran combination or whether they put a more experienced head in there like Hiku as they did on Saturday. Also for the Warriors, starting prop Agnatius Paasi left the game with a left knee injury. May open up more minutes for Burr in the prop rotation there. Rob Jennings and Matt Gillett left Thursday night’s game early with HIAs which seem quite significant. May be touch and go to lace the boots up this weekend. Of most interest would be Gillett, whose injury may open up more time for the likes of Payne Haas. Ash Taylor suffered an early ACL sprain that will see him out for around 1-3 weeks. He can’t take a trick. Judiciary charges for the week came most notably for Addin Fonua-Blake (2 weeks for a high shot on a falling Mitchell Pearce even with an early guilty plea) and Joseph Manu (1 week for a crusher tackle on Sione Katoa). One of, if not the best post game write ups each week. Absolute quality. You will have the Telegraph boys knocking on your door soon! 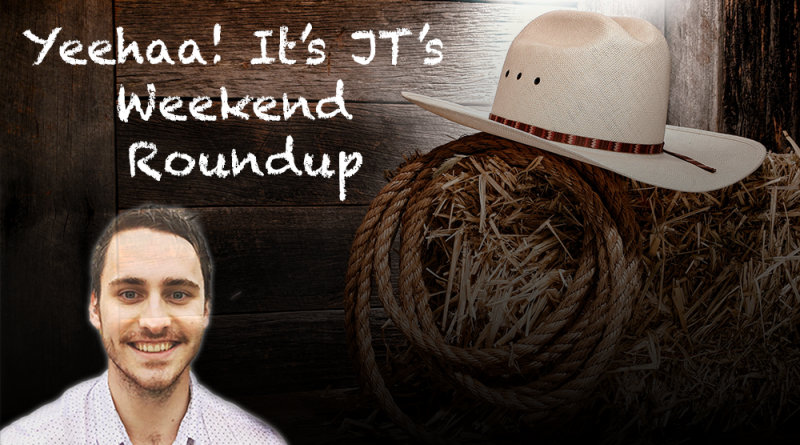 Huge roundup JT! Yee hah! Rope ’em in, tie ’em up & brand ’em! Such an NRL scholar! Keep up the good work. Cheers, AJW! You’re a magician JT. Cracking writeup once again mate. Thanks JT Was away all weekend and this wrap is invaluable! Thx JT, helps put a sc perspective on games I access by radio ,ie anything not shown on 9. Love the width of the wrap! Milford out this week for me. It’s not his scores necessarily, it’s his lack of involvement. He just doesn’t want the ball.